The Colorado Springs Scrabble Club meets every Monday from 6-9 p.m. at Jason's Deli, 7455 N. Academy Blvd. Scrabble lovers of all ages, abilities, and experience are most welcome. We play tournament style Scrabble (one-on-one) and will introduce newcomers (gradually!) to use of the clock (25 minutes per person per game) and formal rules of tournament play. We play three games each session starting promptly at 6pm, 7pm, and 8pm. New players receive a "cheat" sheet to start you out with two and three letter word lists, word lists for the "Big 4" (J, Q, Z, X), and front and back hooks for a variety of words. Please bring equipment if you have it. For more information, please call group organizer Mem Morman at 332-5141. Come sit with us for a spell! Join the Colorado Springs Scrabble Club on Facebook. 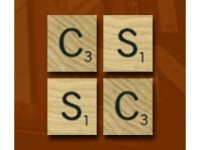 Many of us in the Colorado Springs Scrabble Club use this site regularly and have found it free, safe, simple, and fun. November 2018 We have decided to drop our membership in Meetup.com due to the annual cost. So this is now - and again - the main source for information on the Colorado Springs Scrabble Club. If you haven't attended for a while please drop by on a Monday evening and have a game with the crew. December 2014 Several of us met and made decisions about the club. #1 - Starting in January we will meet on MONDAY evenings at Jason's Deli. Yes, we are changing the day but not the location. #2 - We will have 6pm, 7pm, and 8pm games. To keep this working we will use timers, or will cut off games that are running long. This lets us change opponents for each game. #3 - Keith and Andrea want to start a THURSDAY evening club for more southern folks down near Colorado College - details to follow as available. Some clubs have presidents or chairs, our club has a Bag Lady who is in charge of seeing that the big white bag of boards, tiles, racks, pens, and bingo bells gets to each meeting. Maria is taking this over from Mem - at least for a while. All Hail the new Bag Lady! May 2013 Pikes Peak Scrabble will definitely be playing on through the summer. We have several new players and hope that everyone will join us on Thursday nights at Jason's Deli for word fun and building our Scrabble skills for the Word Cup National Scrabble championship tournament in Denver this August. Denver Word Cup Tournament . 26-28 April 2013 Two of our club members went to the Rocky Mountain Rumble Scrabble tournament in Denver. It was a fun weekend and Keith Hagel ended up a winner. Have a look at the photos here . 21 September 2012 Great night at Scrabble club! We had 7 players and the odd person out worked through the games as we changed opponents when each game finished. It was our night for bingos and the two bingo bells were dinging throughout the evening. Here's a partial list: WINTERED, CRANKED, DALLIER, GUSTIER, INFIELD, TENURES, TUNNELER, LOATHER, SCOOTING, BARONETS, EQUALIZE. We also played TRADINGS and RESHARED which were not challeged at the time, but proved not to be acceptable when we looked them up after the game. Who's coming next week? 2 September 2012 Nine people came to our first fall meeting and we took turns sitting out and moving in to the next open game. We used our "new to us" turntable boards from eBay and there was room for everyone. We also have two new "bingo bells" and we kept them dinging throughout the evening. Keith scored a lifetime best - and certainly the best score ever for our club - with 230 points for a single play with POLARIZE over two triple word scores. Well played, Keith! On 21 June 2012 we had a special club meeting to honor our recent graduate, Jordan Townsend. There was cake - and there were prizes! Lillian won the prize for high score on a 12 letter message text for Jordan, and Kim won a copy of Word Freak for the highest scoring "J" word played with JOVIAL. Our founder, Alicia Reeves showed up for the first time in some months, and presented Jordan with the club's "winner's token" - a set of four dragons playing Scrabble. It was our largest club meeting in some time, and we are hoping it will set a trend! 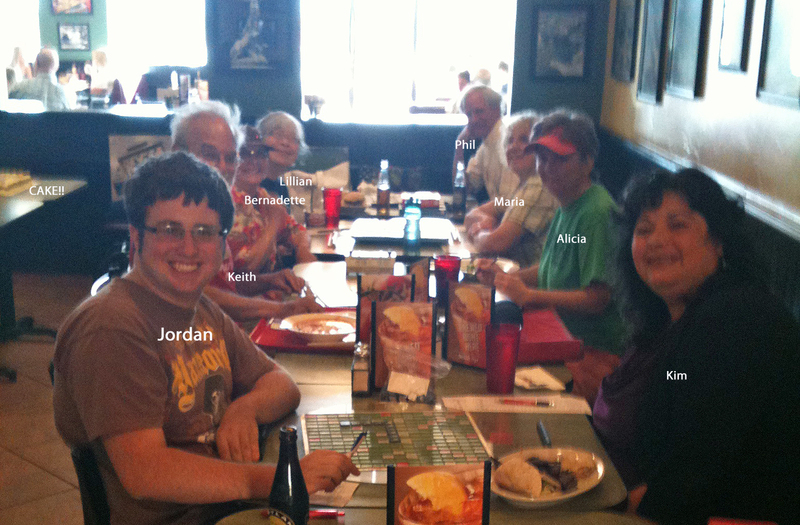 Seven people attended Scrabble Club on 15 March 2012 - Joe and Sue, Andrea, Bernadette, Maria, Malinda, and Mem. Andrea announced a tournament in Durango over Memorial Day - I'll post more information on that soon. During play we determined that SALLY is good, but SALLEY is not. That you cannot UNSLICE or RESLICE bread, but if you want to hold back the sea from swallowing the lowlands you can use either an ABOIDEAU or an ABOITEAU - and try figuring out those words when using two blank tiles! Also that you can RETALLY the score but the person doing it is not a TALLYER.